Bespoke private villas & luxury gated developments. 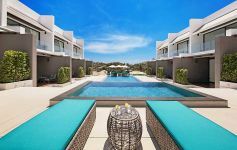 A dynamic innovative company with an outstanding portfolio of villas, apartments and land, we are passionate about delivering the very best possible level of service to our clients. 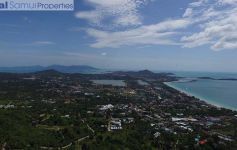 Koh Samui Property : Whether you are looking to buy, rent, sell or develop, we can help. 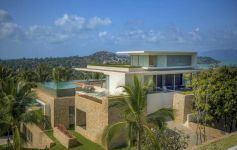 From fully managed gated developments to bespoke private villas, we present Koh Samui's very best residential property. 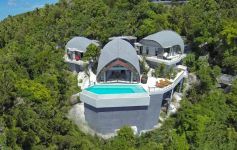 View our rental section, with our extensive collection of exclusive Samui holiday homes and properties available for long term let. 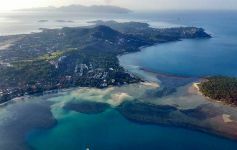 Always searching for the best deals on the market, we have a wide network of local contacts and a diverse portfolio of Koh Samui land. Browse our commercial listings for hotels, resorts, offices and all types of business premises and going concerns. 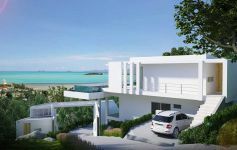 New development of 13 modern garden and sea view pool villas in Plai Laem. 7% guaranteed return for 5 years. Detached and duplex options. 900 metres to Choeng Mon Beach. Recently completed 4-bed sea view pool villa in Bo Phut hillside. Immaculate condition. Bright open plan contemporary design. Stunning ocean and coastal views. Immaculate 3-bed contemporary style sea view pool villa. 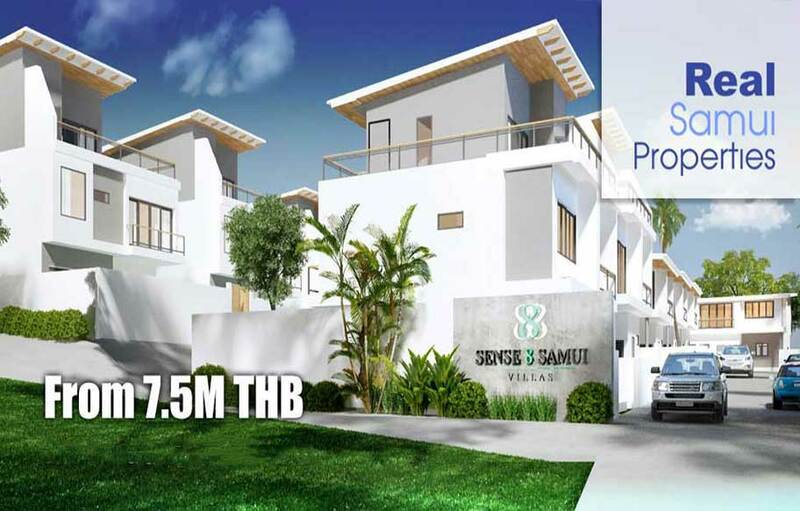 Secure gated estate with premium location in Chaweng Noi. Well established luxury holiday rental villa. 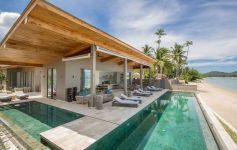 Recently completed immaculate modern 2-bed pool villa by Laem Sor Beach. Bright open plan design with high ceilings. Private pool set within walled-in lawn and gardens. 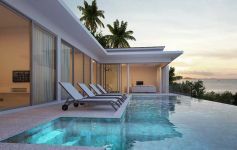 2-level 4-bed designer pool villa in award-winning contemporary resort development at Big Buddha. Panoramic sunset sea views towards Koh Phangan. Highest spec throughout. 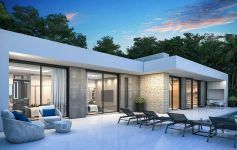 2-level 5-bed designer pool villa in award-winning contemporary resort development at Big Buddha. Panoramic sunset sea views towards Koh Phangan. Highest spec throughout. 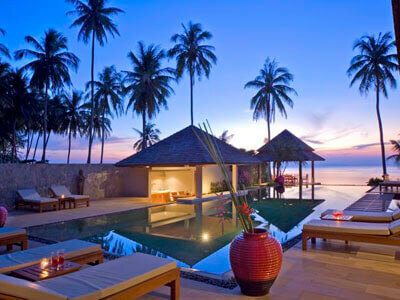 Contemporary sunset-facing panoramic sea view villas. Multi-award winning development. Full in house property and estate management. 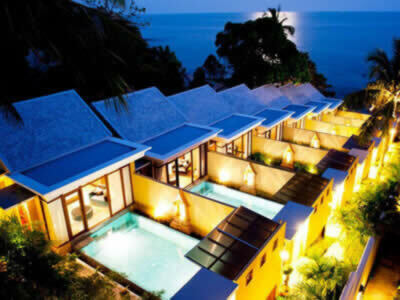 Single-storey 3-bed sea view pool villas in Ban Rak. Fully managed development of 37 detached villas. Full on-site facilities and services. Guaranteed rental returns and villa buy-back options. Spacious and beautifully maintained Balinese style 2-bed pool villa. 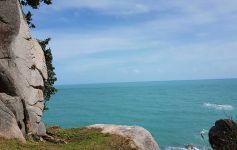 Serene private hillside location just 5 minutes derive from Fisherman’s Village. Prime rental property. Sunset sea view penthouse apartment in contemporary award-winning development at Big Buddha. Incredible views. Excellent rental potential with full in-house property management services. 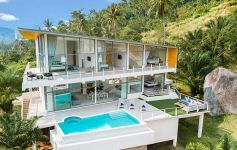 Two identical luxury 4-bed sea view pool villas for sale on Koh Samui’s tranquil north coast at Maenam. Turnkey rental investment that can sleep 16 guests. 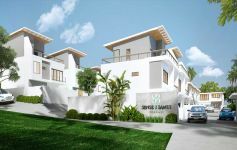 Private estate of 3 and 4-bedroom pool villas. Panoramic ocean views. Cutting-edge designs by David McCormick. Award-winning development. 5 minutes to Lamai. 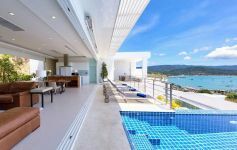 Contemporary 4-bed, 5 bathroom detached pool villa with panoramic views of Chaweng Bay. Boutique 11-villa collection in prime location. No communal fees. 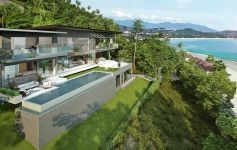 Recently completed 4-bed sea view villa in the prestigious north-east peninsula by Tong Sai Bay. 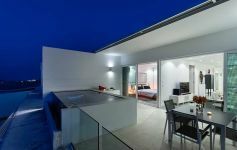 Panoramic close bay views and only 88 metres from the beach. 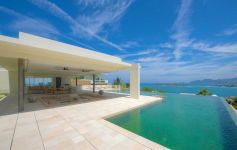 Luxury 6-bed beachfront villa in Laem Sor. Cutting-edge contemporary Balinese design. 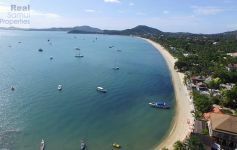 24 metres of beachfront in an exclusive bay in the less developed south of Koh Samui. 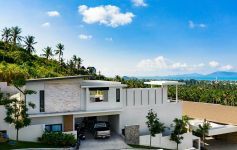 Contemporary 4-bed, 6-bathroom villa in private estate in Choeng Mon. Designed by Gary Fell of GFAB. Full in-house estate and rental management and excellent facilities. 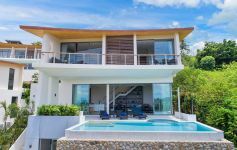 Brand new contemporary 6-bed beachfront villa at Laem Sor, south coast. Tranquil setting on unspoilt beach. 12-metre beachfront pool. Prime rental property. 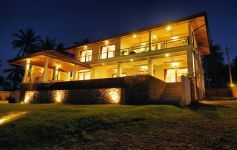 Incredible 5-bed pure beachfront villa set on stunning natural site of cascading granite boulders. Serene white powder sand beach, south-east. 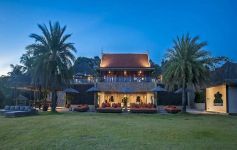 6-bedroom oceanside villa on elevated beach land within private estate in Choeng Mon. Bespoke contemporary design by Gary Fell of GFAB. 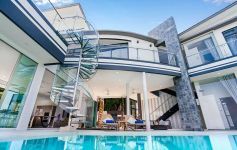 Immaculate contemporary 5-bed beachfront villa at prestigious Samrong Bay in the exclusive north-east peninsula. Brand new and fully furnished to the highest spec. 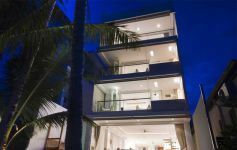 Ultra-modern award-winning 6-bedroom ocean view villa located in Chaweng Noi. Exceptional sea views. 2 private infinity-edge pools. Prime high-end rental property. 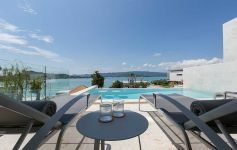 Contemporary 4-bed pool villa with sweeping panoramic views of Chaweng Bay. Just a stone’s throw from the water. Low density boutique collection. 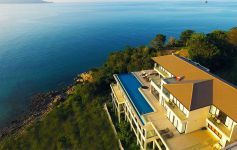 Stunning 6-bed ocean view villa on exclusive headland in Plai Laem. West-facing with unobstructed panoramic sunset ocean views. 25-metre infinity-edge pool. 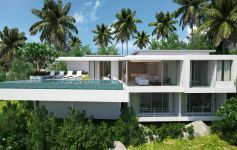 Single-level contemporary 5-bed pure beachfront villa. Premium location in the north-east peninsula at Choeng Mon. Fine sandy swimming Beach. 18-meter infinity pool. 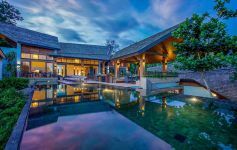 6-bed headland villa located in serene Laem Sor in the south of the island. Very private 2,277 sqm land plot. Very high-spec throughout and first class build and finishing. 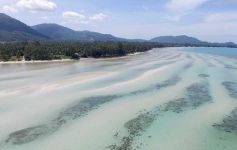 Premium pure beachfront land for sale on the main strip of Chaweng Beach. 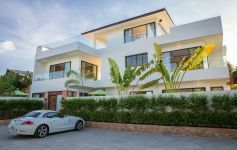 4,394 sqm with 50 metres of beach frontage. Freehold tenure. 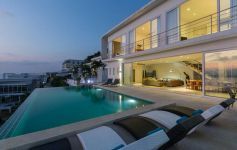 Deluxe 6-bedroom 850 sqm ocean view villa overlooking Chaweng Bay. Chlorine-free infinity-edge pool with 4 jacuzzi jets and poolside sala. 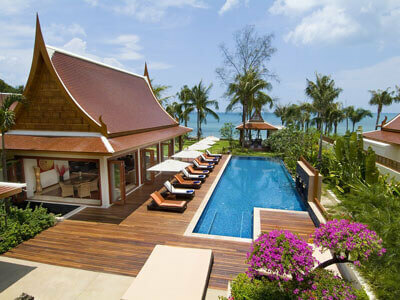 Luxury 7-bed sea view villa in the quite fishing village of Thong Krut. Large infinity pool, tennis court, spa and fitness room. 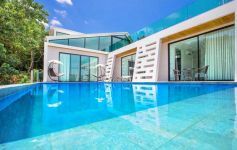 Contemporary ocean view villa with 5 bedrooms, 8 bathrooms and 3 levels. 22 metre infinity-edge pool, spa and fully equipped gym. Secure gated community. 3-bed contemporary pool villa 400 meters off the ring road in Lamai. 50 sqm infinity pool. High exposed ceilings. Large manicured lawn. 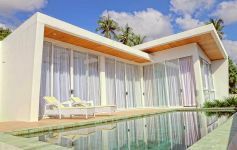 2-bed contemporary pool villa for rent on the south coast of Koh Samui in Lamai. Just 400 metres off the ring road and a few minutes from Lamai Town. 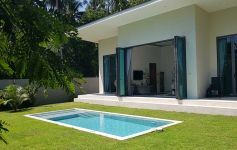 Modern single-level pool villa for rent in Chaweng Noi Hillside. Fully detached with security gates and private parking area. 5-10 minutes from Chaweng Beach. 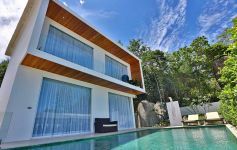 Award-winning luxury villa located at Chaweng Noi. Unique bespoke contemporary design and prime location. Panoramic bay views. Modern beachfront duplex propertiies for rent in Fisherman's Village. 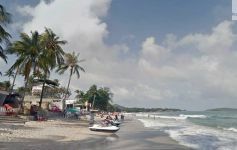 Full serviced, beachfront and sea view. Luxury 5 bed beachfront villa in Lipa Noi. Very spacious. Contemporary Asia design. Private infinity-edge pool. Serene beachfront location. 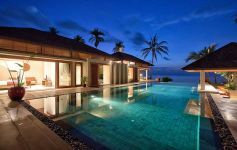 6-bed luxury pool villa for rent. 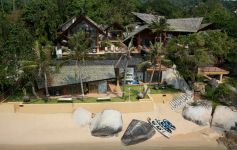 Set in landscaped grounds in a managed estate by unspoilt Ban Tai Beach. 300 metres from the beach. Fully serviced and very spacious. Contemporary 4-bed sunset sea view villa at Big Buddha. Very spacious with exceptional views. Extra self-contained apartment below main living area. 5 minutes to Fisherman's Village. Four-bedroom sea view pool villa for rent in Ban Rak. Just a couple of minutes from Ban Rak Beach and Fisherman's Village. 36 sqm infinity pool and large landscaped gardens. Spacious 5-bed pool villa with fine sea views for rent in Maenam Hills. 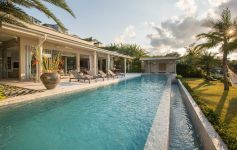 Large private infinity-edge pool with swim-up bar and 5 ensuite bedrooms. 3 levels. 10 minutes to Fisherman's Village. Modern 2-bed townhouses for rent in secure gated development 400 metres walk from Choeng Mon Beach and Village. Recently completed luxury 2-level 4-bed sea view villa for rent in upmarket neighbourhood for Plai Laem. 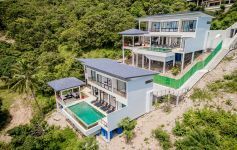 The team at Real Samui Properties were very accommodating and able to fully understand what we were looking for from the outset. They were responsive and offered valuable insights into various properties as well as information about the surrounding areas. As a property developer, we rely on agents to market effectively and generate quality leads. 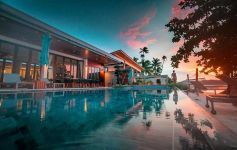 Real Samui Property are one of the few agents we work with that work hard to expand their on-line marketing presence, retain high rankings on internet searches and are proactive in their approach to generating client leads and site visits. 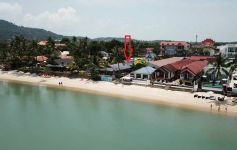 Real Samui Properties was extremely helpful in the purchase of our new home in Koh Samui. When we decided to look for our 2nd home in Koh Samui, we started the research on the internet. 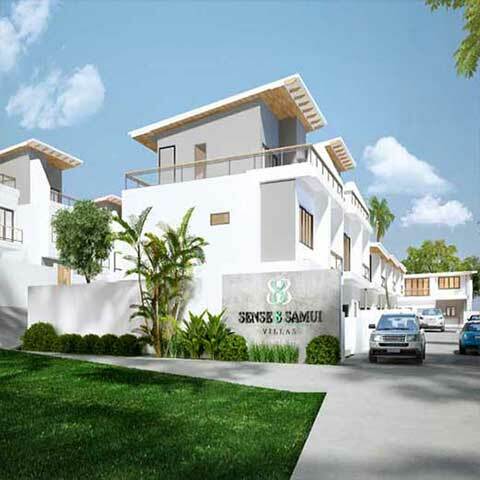 Real Samui Properties impressed us with its comprehensive portfolio of local villas, apartments and land. We are a service led agency with a committed enthusiastic approach. The highest level of personal service is of paramount importance and we strive to deliver a first class service to every client, whether buying, selling or renting. We have always had a particularly strong online presence and to effectively sell a property in today’s market you have to take advantage of the internet. We have a very good understanding of internet marketing and use a broad suite of online strategies and tools to take advantage of the tremendous reach that the internet offers. We are a truly independent agency not affiliated to any developer or seller. We have excellent business relationships with the whole spectrum of Koh Samui property vendors but we are totally unbiased. Our aim is to present the very best possible array of property options to every customer. 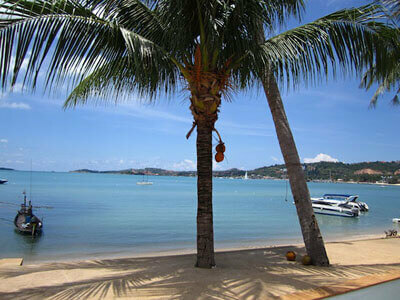 We are highly experienced and have been operating in Koh Samui for over 12 years. 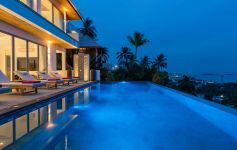 All of our team have an in-depth understanding of the Samui property market and provide first class professional and independent advice. 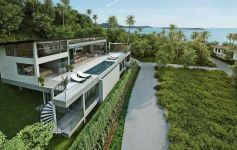 From studio apartments to bespoke beachfront mansions and prime beachfront land, we have a diverse portfolio of property types covering the entire spectrum of quality real estate for sale on Koh Samui. 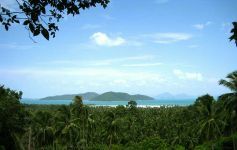 The land that we list is only a small fraction of the land that we have access to in Koh Samui. 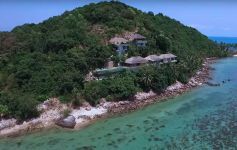 We specialise in sourcing Koh Samui land for clients by looking for a specific location, plot size and type of land (beach, sea view or flat land). So please contact us with your requirements and we will be happy to source your land. We also invite serious investors to contact us for an informal discussion of investment goals and expectations.